Jonathan is a third-generation fruit farmer who attended Writtle Agricultural College in the 1980's and worked in Kent for 6 years before returning home to manage the family farm in 1991. He married Anwen in 1994 and have twin girls, both now at university. They now farm in partnership with Jonathan running the farm and Anwen responsible for the farm shop. North Perrott Fruit Farm's principal crops are apples & pears for sale to supermarkets, all grown on land that has been in the family since the mid 18th century. 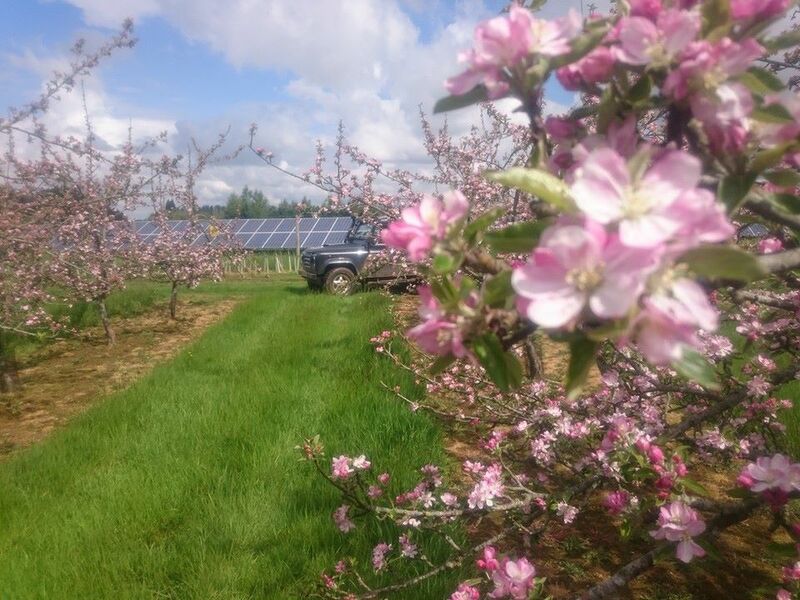 Other crops include cider apples for the Shepton Cider Mill, fodder crops for neighbouring dairy farmers and there is a small solar park on land not suitable for growing apples. The first commercial orchards were planted by Jonathan's grandfather in 1930 and in 1950 he consolidated some of his estate to build an extensive storage and packing facility on the farm. Britain joining the EEC in 1973 was generally bad news for English fruit growers and particularly bad for Jonathan's father, as the stores and grader were all needing replacement and modernisation. The sensible option was to join a co-operative but being in Somerset, the farm was rather out on a limb compared with other counties more closely associated with growing dessert fruit. He chose to join Wye Fruit Ltd in 1975, not as the closest co-operative but as what he felt was best organised and with the best leadership for the future. Looking back, it was probably the best decision he ever made and is the sole reason the farm is still growing dessert fruit today. Much has changed in the last 88 years but growing apples and pears is still the main focus and with a farm shop established in 1970, we are very much a traditional family business. Although we grow almost 40 varieties of apples and pears on 25ha, only 6 of these are grown in any quantity, the others being pollinators or in very small quantities for sale through the farm shop. In the last ten years the variety profile has changed away from traditional varieties such as Cox's Orange Pippin, Egremont Russet and Bramley in favour of Gala, Junami and Early Windsor with Conference as the major pear variety. Apples that don't make the stringent quality for class one are pressed on the farm and made into 30 apple juices, all from named varieties. Apple juice is sold in the farm shop and via wholesale distribution, all over the South West and the now redundant 1950's farm buildings are mostly let as light industrial units.